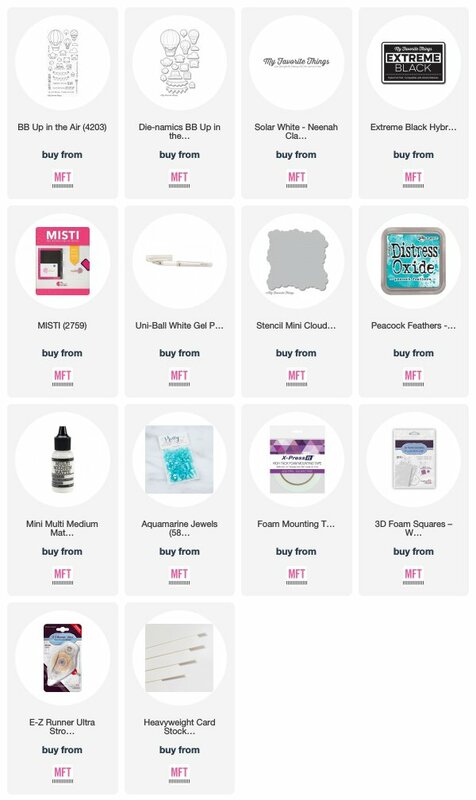 Hello and welcome to Day 4 of the MFT September Release Countdown! Did you enjoy yesterday's reveal? We have lots more to share with you! This release is packed with amazing products and it will be available Tuesday, September 4th at 10AM EDT. 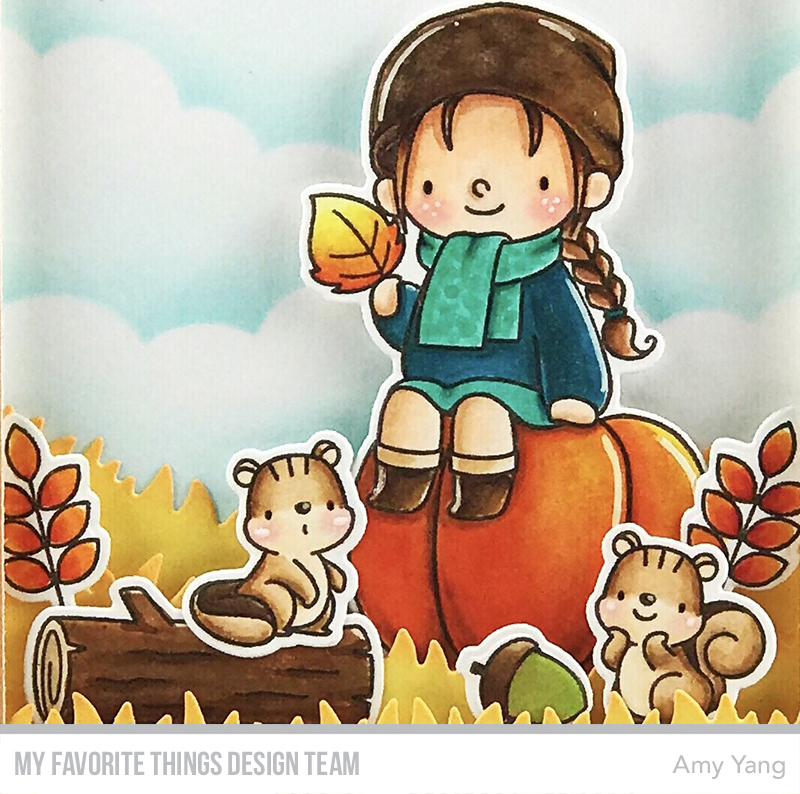 Today, my card features one of my favorite stamp set from this release called BB Fall Friends. 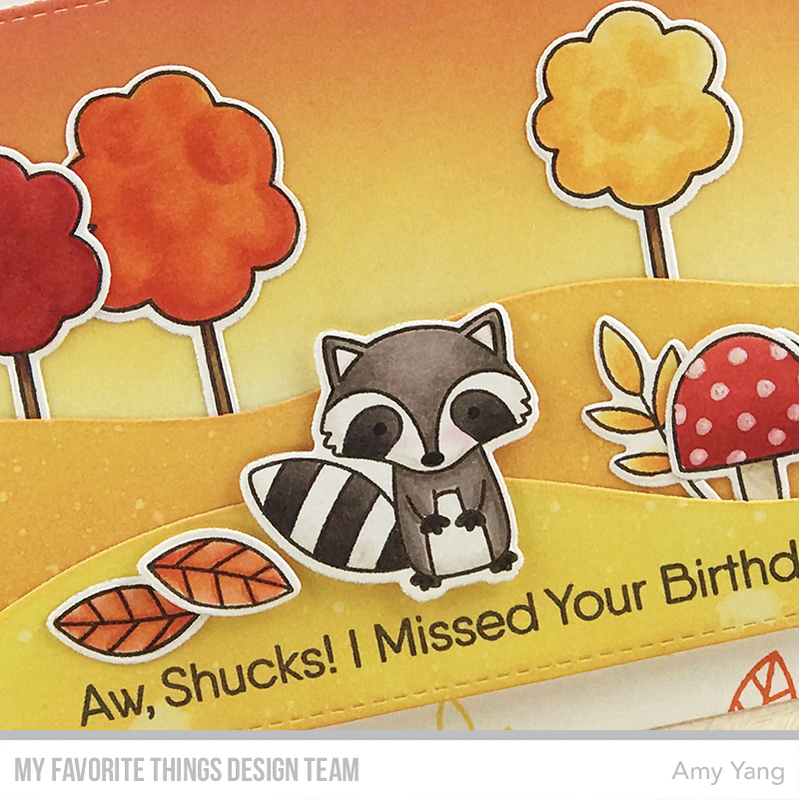 To begin, I Copic colored the adorable stamped images from BB Fall Friends and cut them out with the coordinating dies. For the background cloud panel, I used the Mini Cloud Edges stencil with Peacock Distress Oxide. The three grass panels were cut with the Grassy Hill Die-namics and ink blended with Wild Honey and a little bit of Carved Pumpkin for the tips of the grass. On the shortest panel, I stamped the sentiment for BB Fall Friends with Milk Chocolate Hybrid Ink. For the polka frame, I used Orange Fizz paper from the Itsy Bitsy Polka Dots Pastels Paper Pack and die-cut it with 2 dies from the Rectangle STAX set to make the frame. To add depth and dimension to the card, I adhered the cloud panel onto a top folding card base. Then, I adhered the tallest grass on top of the cloud panel. Next, I foam mounted the second tallest grass and foam mounted the shortest grass panel on top of that. I added two layers of foam tape to the frame only in the areas that needed it (middle to the top), taped the other areas, and mounted the frame on top of the panels. Lastly, I added the images in between the panels as shown. Thank you so much for visiting me today! I hope I'll see you again tomorrow for Countdown Day 3! 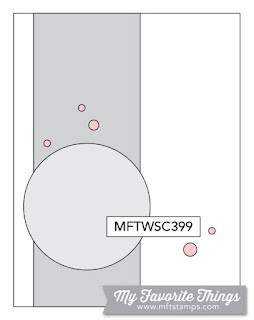 Hello and welcome to the MFT September Release Countdown kickoff! All of the amazing new products will be available Tuesday, September 4th at 10AM EDT. Make sure to stop by the MFT Blog every day for the next five days to see the full reveal. 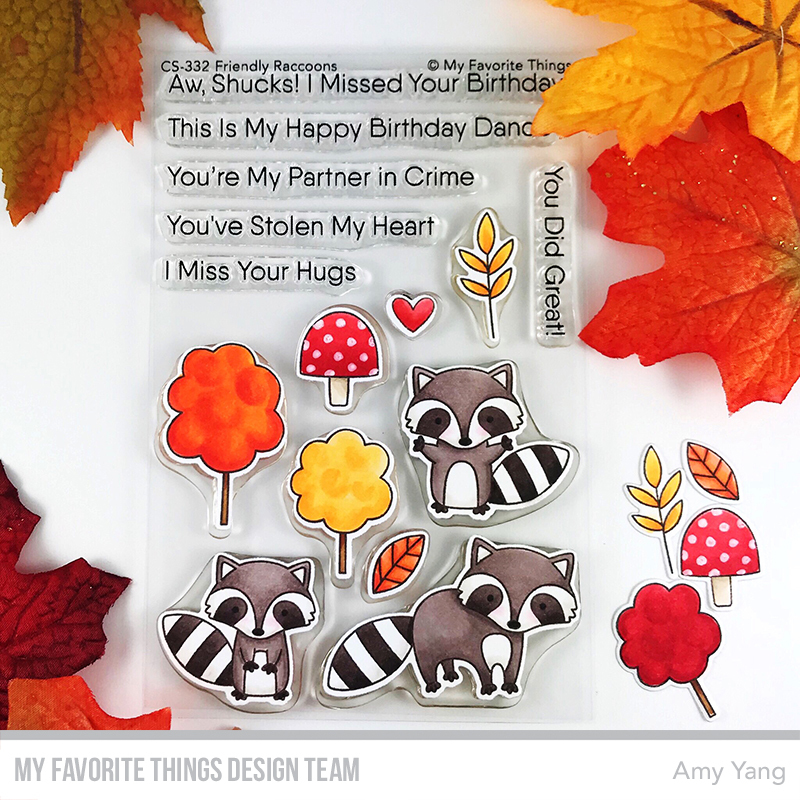 My card today features the adorable and new Friendly Raccoons stamp set. 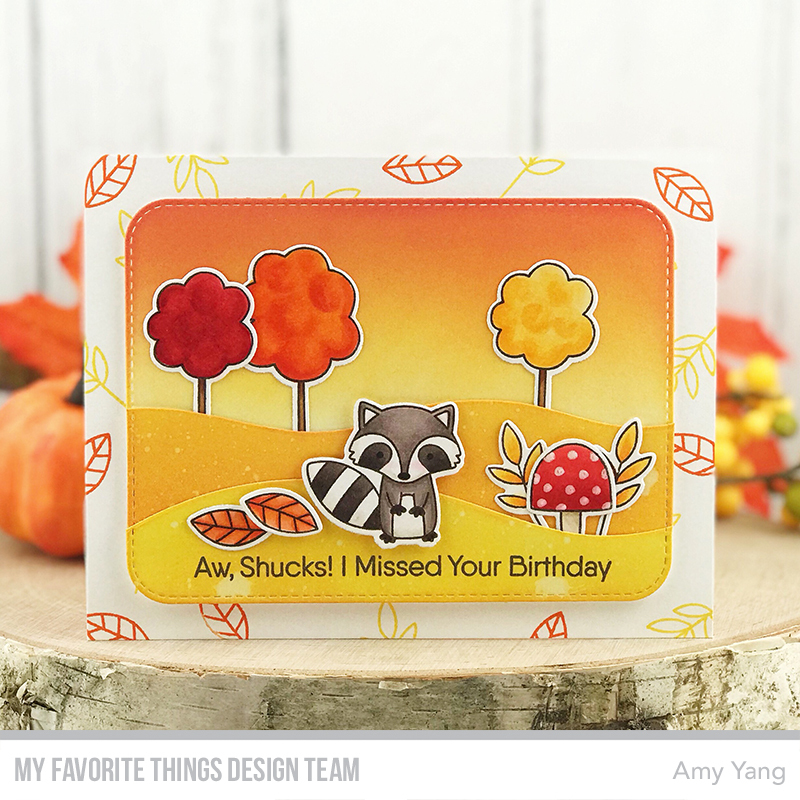 Since we're heading into the fall season I created a belated birthday card with an autumn scene for the sweet raccoon. I Copic colored the stamped images from the Friendly Raccoons stamp set and cut them out with the coordinating die-namics. To create the front panel, I used a large stitched panel from the Blueprints 31. I used the Snow Drifts Die-namics to make hill panels. I inked the three panels using Distress Oxides (see colors under supplies) I added splatters of water to the hill panels to add some texture. The sentiment was stamped on the front hill panel with Milk Chocolate Hybrid Ink. 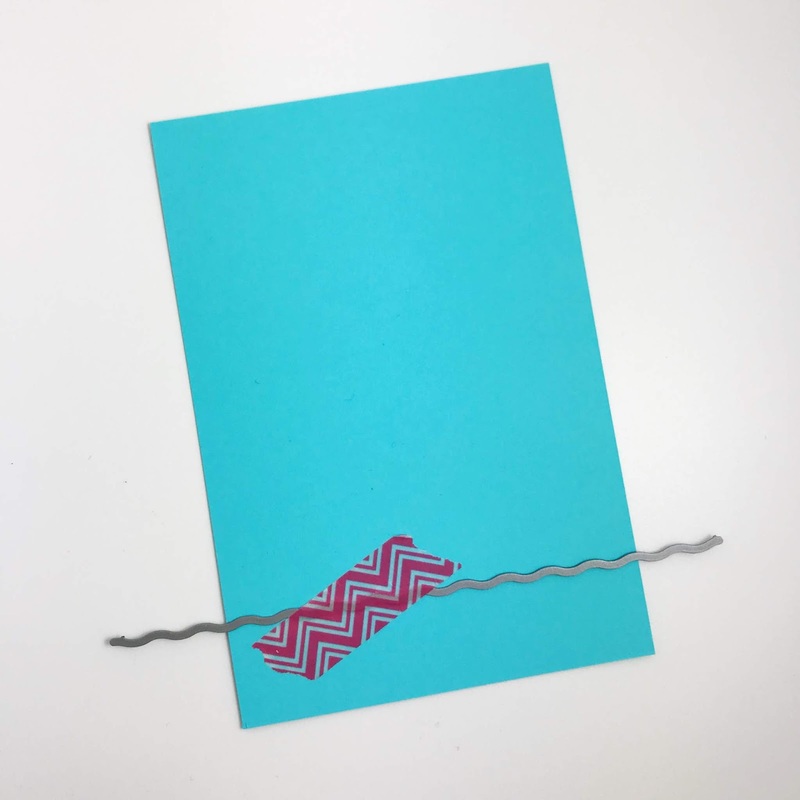 To add more interest to the card, I created a patterned background using the smaller stamps from the set onto the front of the top folding card base using Lemon Drop and Coral Crush Premium Dye inks. Thank you so much for visiting me today. I hope I'll see you again tomorrow for Countdown Day 4! I Copic colored the stamped images from BB Up in the Air and cut them out with the coordinating dies. To create the cloud front panel, I masked the sides with washi tape to match the sketch and used the Cloud stencil with Peacock Feathers Distress Oxide. To finish, I foam mounted the colored images and the sentiment. I also glued on a few Aquamarine Jewels. It's a fun sketch! I hope you'll play along with us. Visit the Card Challenges blog for more information on the sketch challenge and inspiration from the participating design team members. The newest card kit from MFT called Beautiful Bloom is now available at the MFT Boutique. 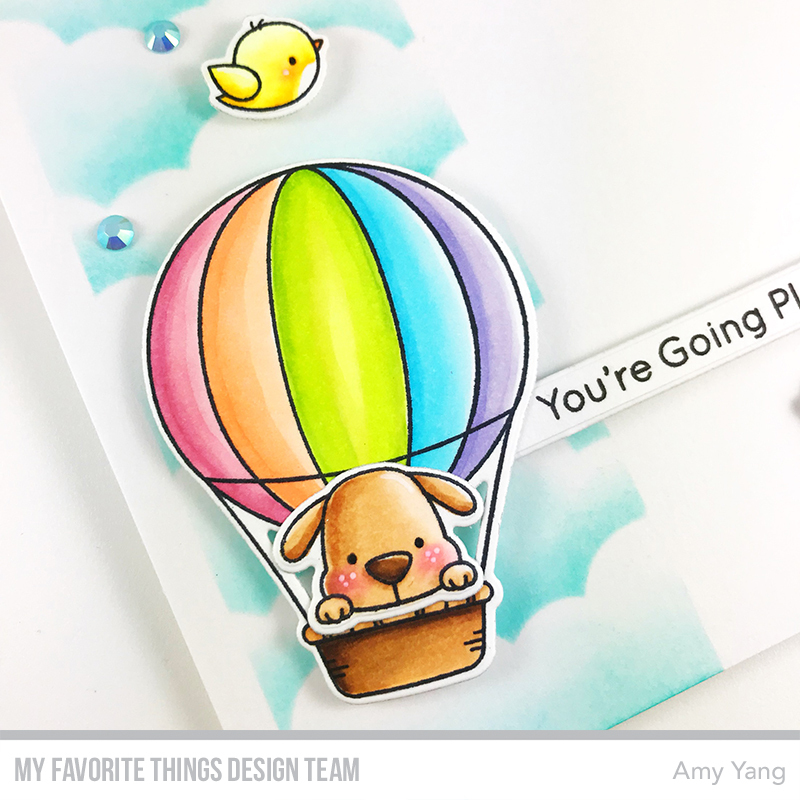 Today, I'm sharing a watercolored card using some of the products from the amazing new kit. 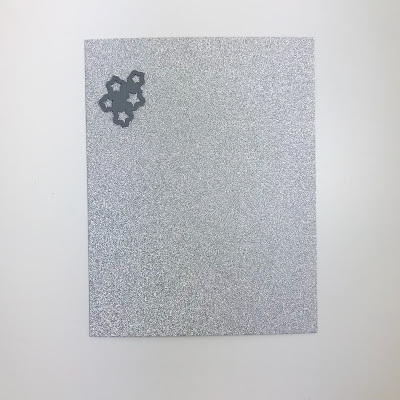 To begin, I heat embossed the flower from the Beautiful Bloom stamp set on watercolor paper with gold embossing powder and colored them with Daniel Smith Watercolor. I covered the stamped flowers and added gold splatters for added interest. Then, I die-cut the panel using the largest die from the A2 Stitched Rectangle STAX Set 1 Die-namics for the nice stitched detailing. After, I adhered the panel to a top folding A2 sized Tropical Teal Prestige Card Stock. The sentiment "Beautiful" was die-cut with the Beautiful Die-namics using Gold Sparkle and Tropical Teal cardstock. 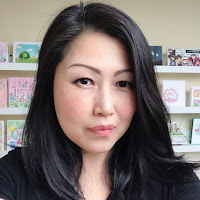 The "Inside and Out" sentiment from the Hello, Beautiful stamp set was heat embossed in gold on Tropical Teal cardstock and cut out with a die from Hearts in a Row Die-namics. 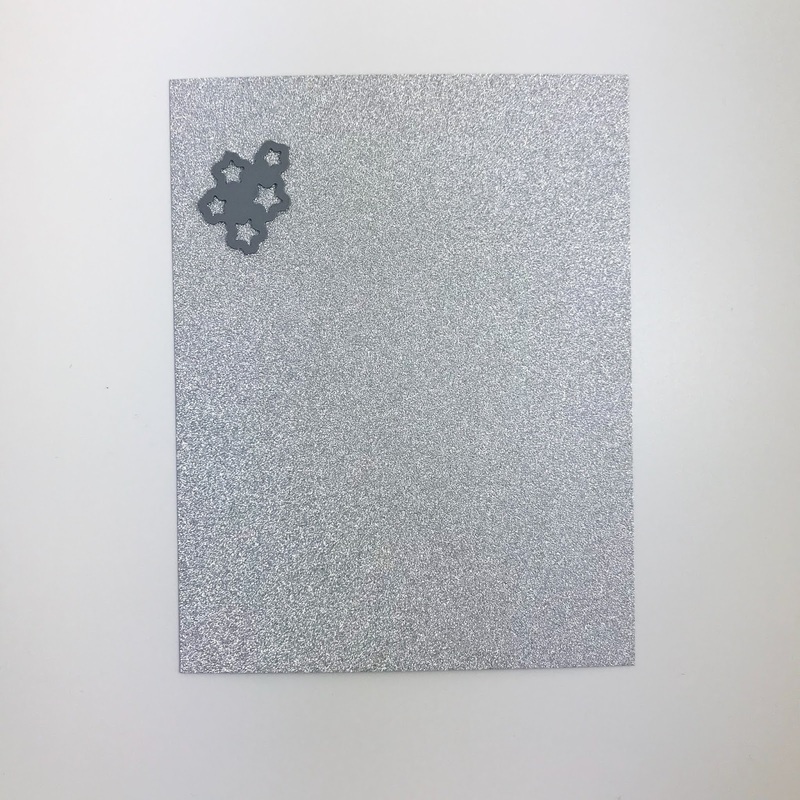 Make sure to visit the MFT Blog for more details on the Beautiful Bloom Card Kit and to see amazing inspiration from other participating team members. 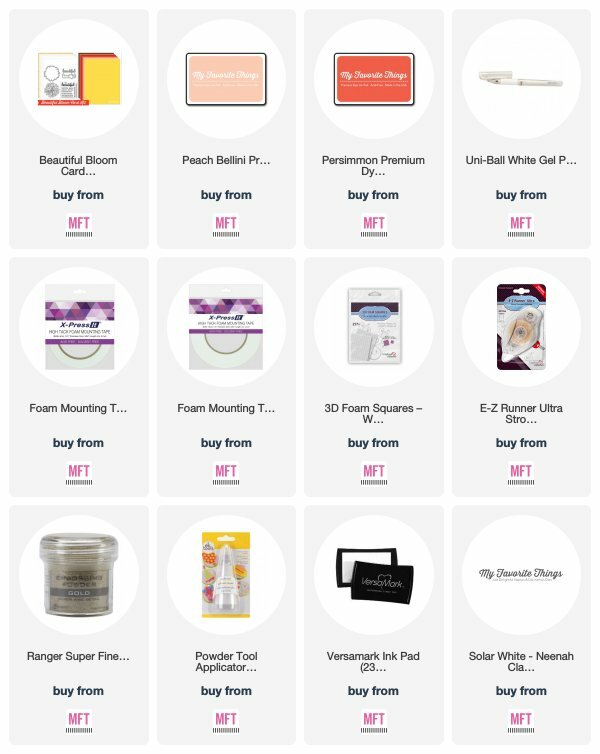 Hello and welcome back to the MFT August Card Kit Countdown Day 2. 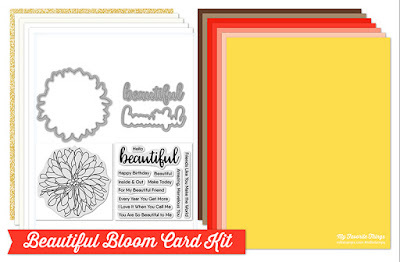 The Beautiful Bloom card kit will be available for purchase tomorrow, August 21st at 10AM EDT. I stamped the flower from the Beautiful Bloom stamp set with Peach Bellini Premium Dye Ink on Neenah paper. I colored the image with Copic Markers and cut it out with the coordinating Die-namics. The background panel was stamped with Persimmon Premium Dye Ink using the masking technique. I mounted the panel onto a top folding A2 sized Peach Bellini card base. On top of the stamped panel, I added a layer of vellum to give it a softer look. I heat embossed the sentiment "Make Today" in gold from the Hello, Beautiful stamp set on the vellum. To adhere the vellum to the background panel, I added double sided tape behind where the Copic colored flower is foam mounted. The "Beautiful" sentiment was die-cut with the Beautiful Die-namics using Gold Sparkle card stock. 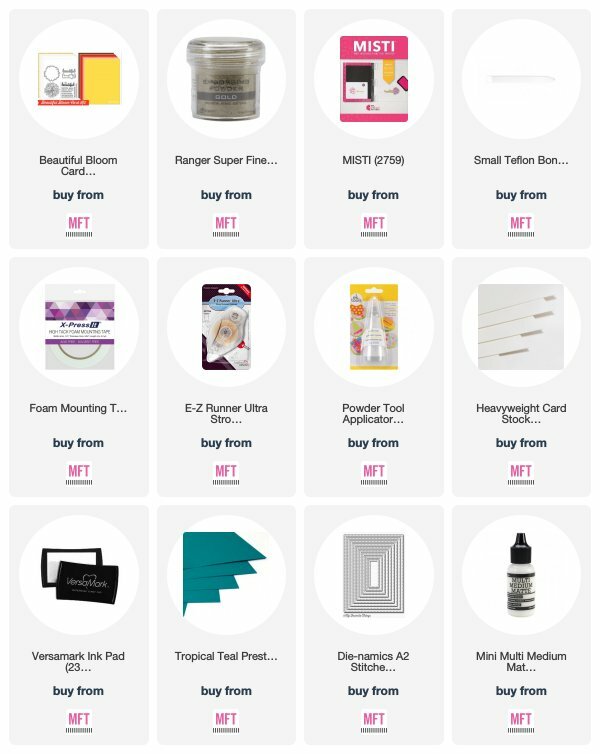 Make sure to visit the MFT Blog for more details on the Beautiful Bloom Card Kit and to see amazing inspiration from other participating team members. 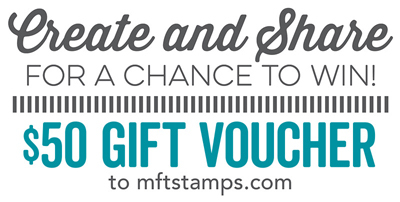 Leave a comment on the MFT Blog for a chance to win a $25 Gift Voucher! Thank you so much for stopping by! I hope I'll see you again tomorrow for my Release Day project. Hello and welcome! I'm here today to introduce and share my project using the newest Beautiful Bloom Card Kit from MFT. It will be available for purchase on Tuesday, August 21st at 10AM EDT. I stamped the flower from the Beautiful Bloom stamp set (included in the card kit) with Sweet Tooth Pigment Ink on Black Licorice Prestige Card Stock. Then, I used the Polychromos Pencil to color it in and used the coordinating Beautiful Bloom Die-namics (also included in the card kit) to cut it out. What do you think? It was my first time using colored pencils on black cardstock. It took some time, but I had so much fun doing it! For the front panel, I die-cut Black Licorice Card Stock with the largest die from A2 Stitched Rectangle STAX Set 1. Then, I stamped and heat embossed the "Hello" sentiment from the Hello, Beautiful Stamp Set (included in the card kit). Then, I added white splatters with Copic Opaque White that I diluted slightly with water. For the "Beautiful" sentiment, I used the Beautiful die-namics (included in the card kit). To finish, I foam mounted the die-cut flower and the "Beautiful" sentiment onto the front panel for dimension. Appeal to a modern aesthetic with a clean & simple look that minimizes extras and puts the focus *squarely* on the occasion with this month’s Birthday Project challenge! Join our team in crafting fresh looks for the minimalists in your lives. 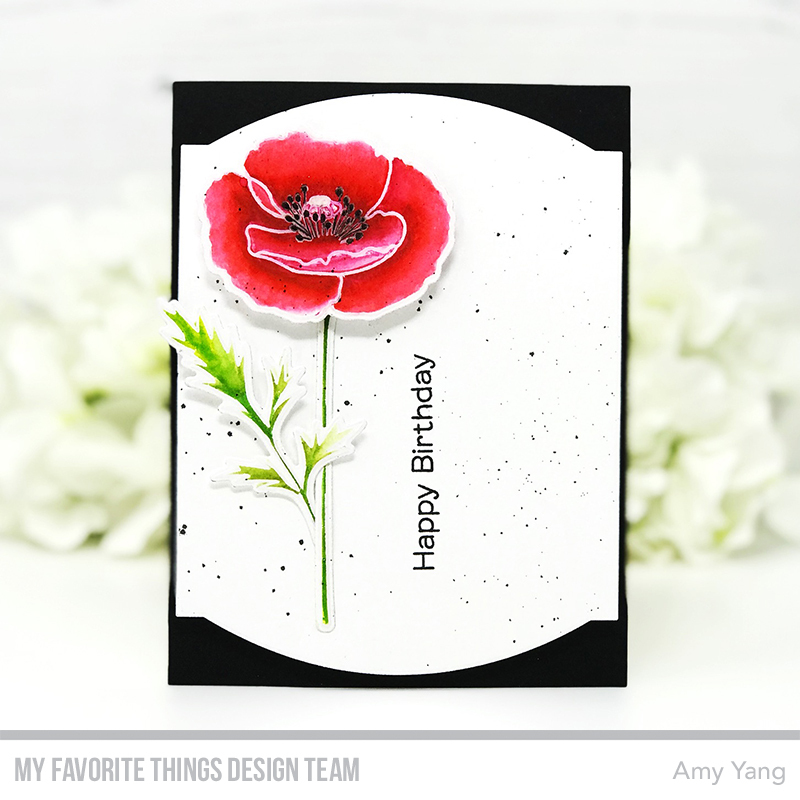 My CAS card today features the Painted Poppies stamp set. 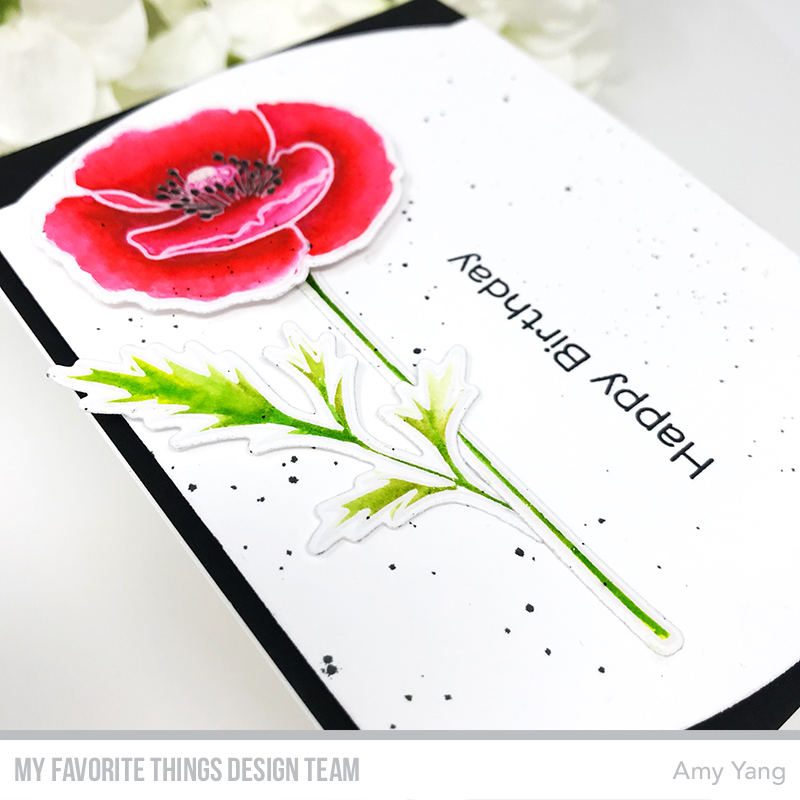 The flower from the Painted Poppies stamp set was heat embossed in clear embossing powder and colored with Zig Clean Color Real Brush Markers. I used the coordinating dies to cut them out. 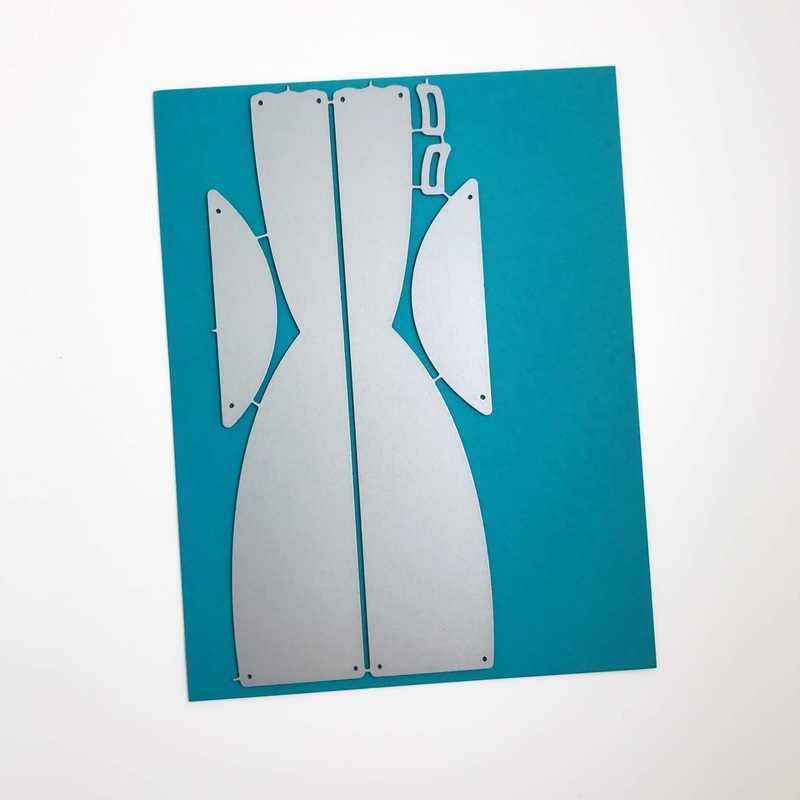 The white panel was die-cut with the largest die from Elegant Rectangle Die-namics. I used Black Soot Distress Oxide mixed with water for the black splatters. The sentiment is from The Fluttering Friends stamp set and I stamped it with Extreme Black Hybrid Ink. I foam mounted the elegant rectangle panel onto an A2 sized Black Licorice Prestige Card Stock. Then, I glued on the stem and leaf and mounted the flower. 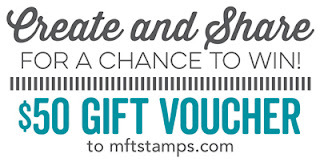 I hope you'll play along with us for a chance to win a $50 MFT gift voucher. For more information, visit the Card Challenges Blog! Hello there! 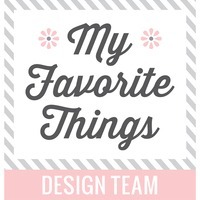 I'm back with the My Favorite Things monthly feature called MFT & Friends, where the design team is joined by friends with projects showcasing the awesome August release. Today my card features the Tuto Trio stamp set. The adorable bunnies and the bear are dancing on top of puffy clouds to wish the card's recipient a Happy Birthday. The stamped images from Tutu Trio were colored with Copic markers and die-cut with the coordinating dies. The A2 sized front panel was inked with Picked Raspberry. To add texture, I spritzed it with the water sprayer. Once it dried, I heat embossed the sentiment in white. The clouds were die-cut with the Stitched Cloud Edges Die-namics. I lightly inked the clouds with Peacock Feathers and spritzed it with water. To finish, I adhered the cloud panels onto the front panel and foam mounted the images on top as shown. For some sparkle, I glued on a few sequins from the Sparkling Clear Mix. Hello there! 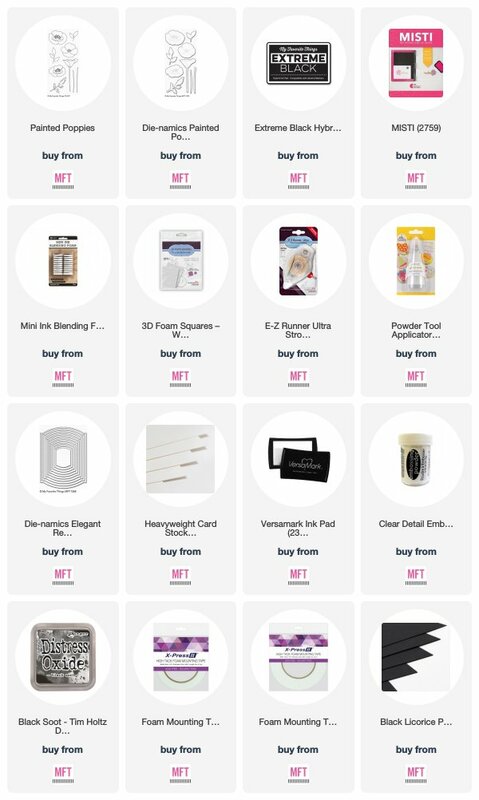 I'm back with the MFT Techniques & Tutorial feature, where the design team shares cards accompanied by detailed instructions and step-by-step photos using the products from the newest release. I have a simple A2 sized (when folded flat) interactive shadow box-card to share with you today, and it features the Friendships Rocks stamp set along with the Take the Stage Die-namics. 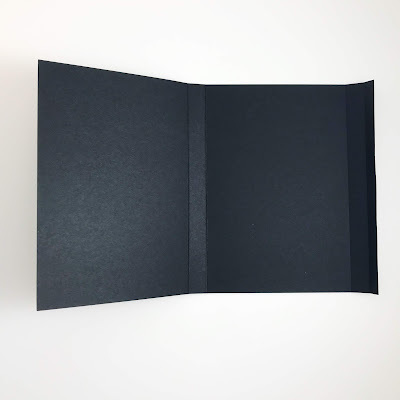 To make the box, trim Black Licorice Prestige Card Stock to 8 3/4" x 5 1/2". 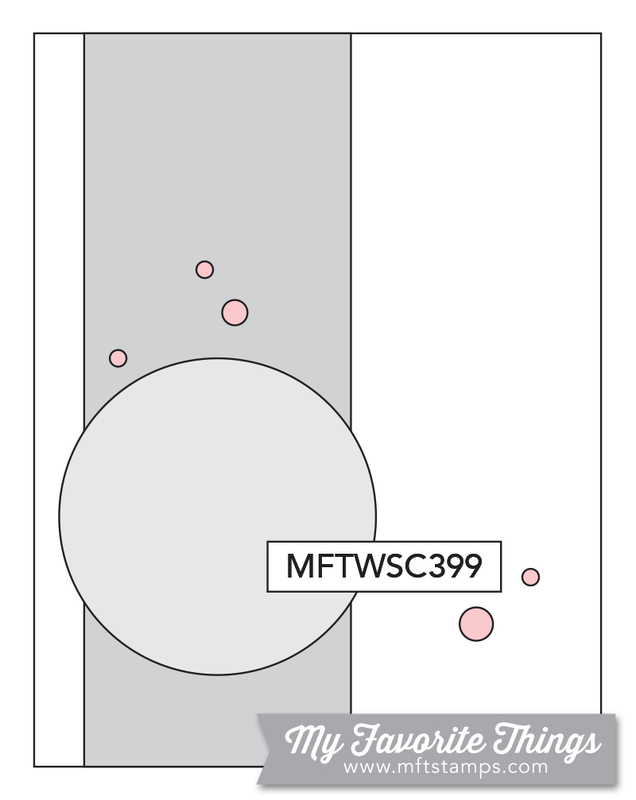 Then, scores lines at 3 3/4", 4 1/4", 8 1/2", 8 3/4". Fold at the lines. 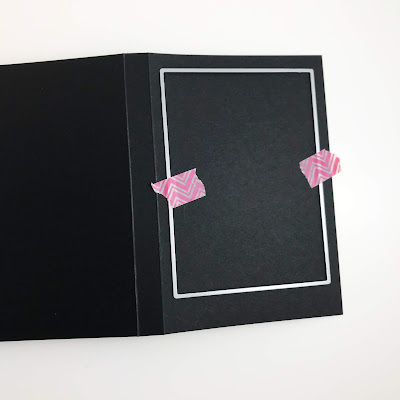 After, die-cut the front of the box with a die that measures approximately 4 3/4" X 3 1/2" from the A2 Rectangle STAX Set 1 to create the opening. Add 1/4" Scor-tape to the 1/4" folded tab. Create a tab to insert into the box so you can attach the girl with an invisible string. Attach the string going up her back to the top of the tab. Attach the string to the tab with regular tape. This allows the girl to sway back and forth if you move the box card. To make the tab, trim Black Licorice Prestige Card Stock to 1/4" x 4 1/4" and score lines at 1/4" and 4". Add Scor-tape to the folded ends. 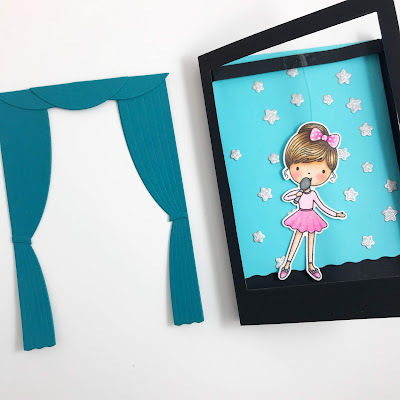 To make the stage curtains, use the dies from Take the Stage Die-namics and die-cut the Tropical Teal Prestige cardstock. 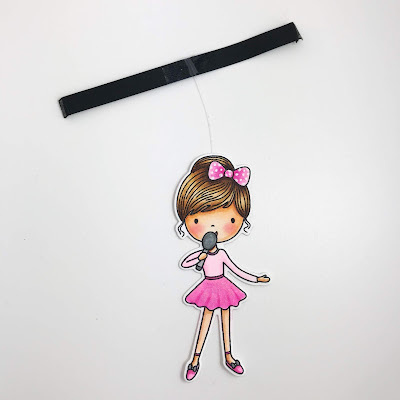 From the same set, use the wavy die to die-cut Heavyweight Blu Raspberry Cardstock for the back of the stage curtains, making it a little shorter than the stage. To make the stars for the back of the stage curtain, die-cut Silver Sparkle Card Stock using the star dies from Friendship Rocks Die-namics. Glue them on to the die-cut Blu Raspberry Card Stock. 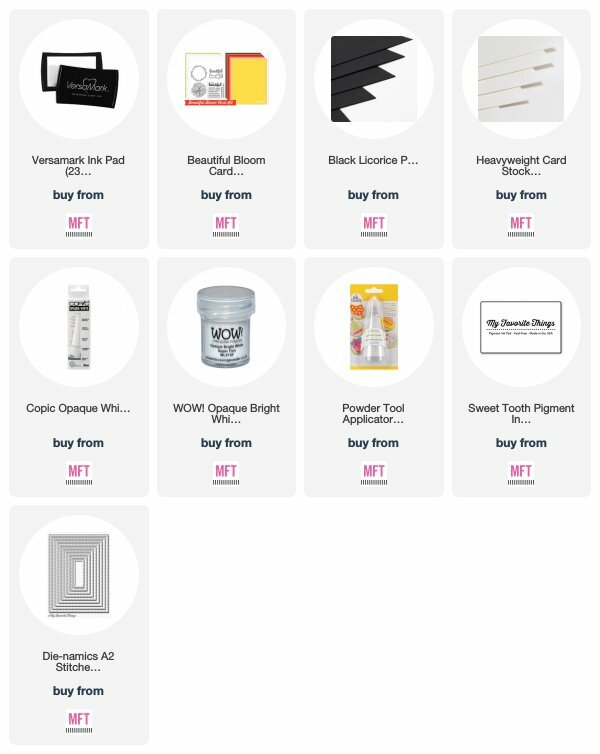 Apply a Powder Tool Applicator on Black Licorice Prestige Card Stock. 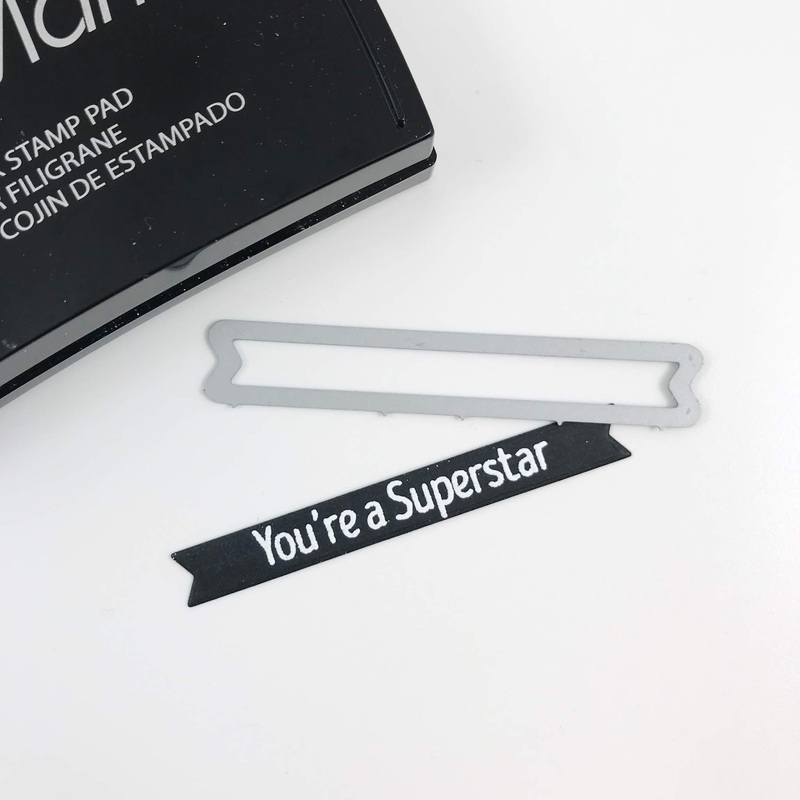 Stamp the sentiment from Friendship rocks with Versmark Ink and heat emboss it white. Then, die-cut it with a die from Hearts in a Row - Vertical Die-namics. To finish, glue the Blu Raspberry curtain to the back of the box. Then, add the insert with the girl and adhere the box close. To finish, adhere the curtains to the front of the box ( I used 1/8" and 1/4" Scor-tapes) and the die-cut sentiment.